The electrical outlets in your home share wiring connections, so when one appliance causes an issue, the other appliances, especially those in the vicinity, may be affected as well. If an air conditioner in your home is surging, it may cause power surges through the lines, which can cause power surges through other appliances. An air conditioner generally surges when turning on and off. Power surges can be natural or man-made. A natural source of power surges is lightning, which can cause a sudden spike in the electrical current running through your home if it strikes a power line connected to the house. Man-made power surges can come from the air conditioner itself. This normally happens when the unit requires a burst of power, which occurs when the unit turns on and off. A surging air conditioner generally causes the electricity in a home to turn itself off before the power surge has a chance to cause permanent damage to computers and other devices in your home. This process occurs at the breaker or fuse box. In the case of a breaker box, a power surge causes a switch to flip or "trip." In the case of a fuse box, the surge causes the fuse to blow out. Either a tripped air conditioner breaker or a blown-out air conditioner fuse requires a simple repair. In the case of a breaker, turn the breaker back to its "On" position by flipping the switch to the same side as the other breakers in the box. In the case of a blown fuse, you must replace the air conditioner fuse in the fuse box with a new fuse. Even though a tripped breaker or blown fuse easily can be repaired, you need to find a more efficient solution to a surging air conditioner or you will have to do a lot of breaker flipping and fuse replacements. In an older home, the electrical outlet into which the air conditioner is plugged may not provide enough electricity to support the unit's power needs. In this case, some rewiring may be required to fix the issue. 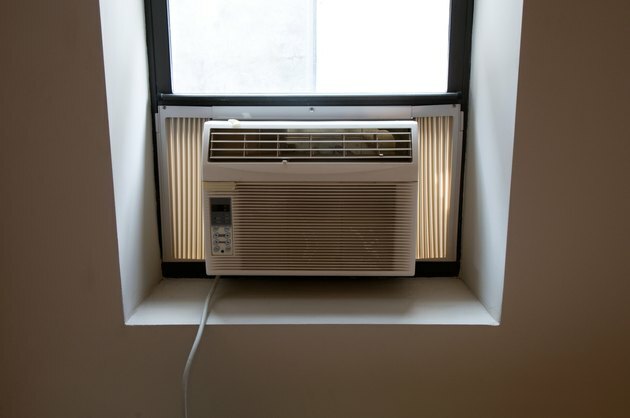 In most instances, smaller fixes can stop surging, such as keeping other appliances in the room off when the air conditioner is on and plugging the unit into a surge protector. Can You Run a Portable Air Conditioner on a Surge Protector?